Amnesia: The Dark Descent mod brings in... Pokémon? Well, FINALLY. 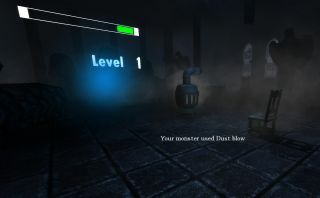 A brave soul has at long last taken the completely logical step of modding turn-based Pokémon-style combat into Amnesia: The Dark Descent. The mod is called Monsters, and no, it doesn't feature fiery lizards and and squirting turtles and yellow electric squirrels (sorry, I don't really know much about Pokémon, which is going to become quite clear). Instead, your monsters are props from the game, like chairs, boxes, tables, wine barrels, and stoves. Stove, I choose you. Respond by saying, I dunno... "stove" I guess? After a brief intro where you find an orb and rub it with some orb wax, you unleash some sort of... I don't really know what it is. A powerful spirit that wants to play Pokémon against you? Something like that. After fleeing the energy being, you encounter an angry walking suit of armor, and a small friendly crate who fights it for you. This crate is your first Pokémon, and it has a single power, wood aura, which flings boxes at your enemy. This is some sort of Pokémon business happening, I'd wager. With your trusty crate (fully voiced, and quite well, by the way), you can visit various rooms and find opponents waiting for you. Use your crate to defeat, say, a stove, and you gain a power from that stove. You also gain experience points to increase your level, and can evolve into other forms. I presume actual Pokémon works in roughly the same way? Damn you, barrel of wine! I played for a bit and it's fun. I evolved my crate into a chair, gaining a dust storm power, and then evolved from a chair into a stove, gaining a smoke power. Then, I tried to alt-tab out to read the manual and the game crashed, so don't do that. But do download the manual, as it lets you know what sorts of powers do best against which sorts of monsters. Do I want to evolve into a stove? Hell yes I do. You didn't even need to ask. I started over and became a chair again, and then tried to take on the boss of the level, which turned out to be quite a powerful monster and not as warm and cuddly as the various pieces of furniture I'd been battling with. I think I'll go back to fighting tables and wardrobes until I've gotten a bit better. This is a really fun mod and a very unusual idea: bringing turn-based furniture combat into a game famous for having no combat at all. You can grab it off moddb.com. Someday my crate will use Spookbones. This I so swear.